It's been a while since I analysed something with R. I decided to pick into Dota 2 statistics. This game is the real eSport now with players fighting for respectable prise pools. And the main Dota 2 event is The International where best teams compete each other in astonishing battles. So I grabbed some stats on The International 3 from here and started to think what can I do with it... The one major aspect of the game that was actively discussed prior the Tournament was the Dire side has an advantage over the Radiant via having Roshan Pit in their possession. Many people still think that Dire side is preferable in competitive games (they say that Roshan is killed by the Dire in 70% of cases). 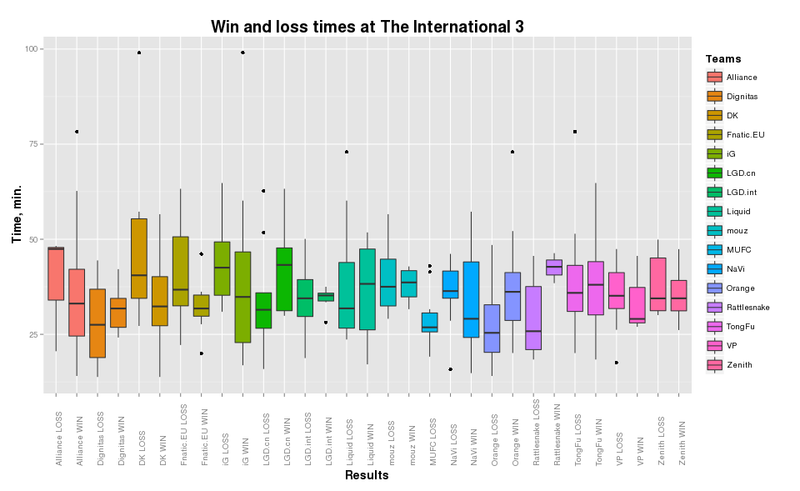 In fact The Alliance (TI3 winner) played like 90% of their games on the Dire side at the tournament. But is it a valid proof of the Dire side advantage? - I doubt. I think that in contrary - the Radiant side has an advantage over Dire, but I will add my arguments after I prove I'm right. Clearly, the Radiant side generally wins slightly quickly then Dire (and have higher number of wins: 82 against 76). This means that not the Dire, but the Radiant team has an advantage in game. But why? (You may skip the rest of the paragraph if you never played Dota). There are several reasons. Radiant advantages are: easier rune control, ability to deny creeps at the hard lane, camera angle (it is not parallel to the terrain surface and facing north towards the Dire side). Camera angle was never discussed as the advantage/disadvantage because most people just got used to it, but Radiant has slight, but sure vision advantage. Seems Roshan accessibility and a safer ancient camp does not help that much to the Dire. 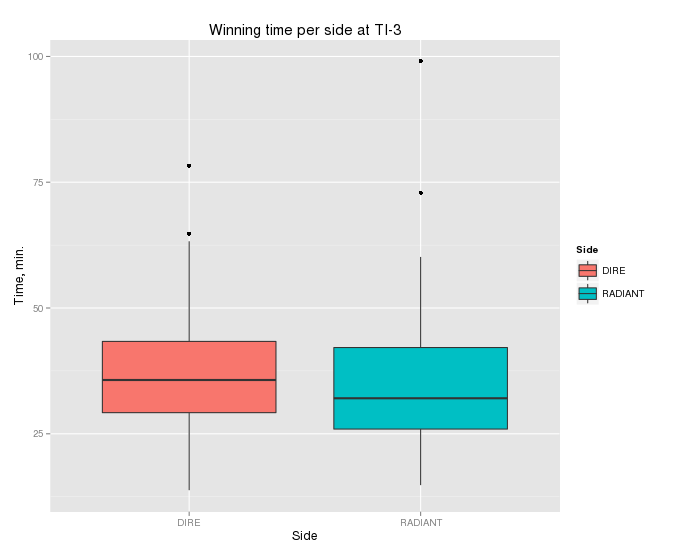 Generally my assumption was correct: better teams wins quicker. Alliance and NaVi (1-st and 2-nd places) is a nice conformation to it (DK and IG (TI-2 champion) have the similar pattern as well despite shared 5-th place). But Orange and TongFu (3-rd and 4-th place) tends to loose quicker than win. This could be explained by the general playstile of this two Asian teams which often aims at the late game. This infamous style with prolonged no action farming stage is often referred as 'Chinese Dota'. But DK and IG are Chinese teams too. Seems that both TongFu and Orange were able overcame the odds and jumped over their heads in the given tournament. They took places that DK and IG should have get (DK and IG were more favourable teams than Orange and TongFu before the tournament).